A James Cook University and National Geographic expedition to Cape York Peninsula in north-east Australia has found three vertebrate species new to science and isolated for millions of years—a bizarre looking leaf-tail gecko, a golden-coloured skink and a boulder-dwelling frog. Earlier this year Dr Conrad Hoskin from James Cook University and National Geographic photographer and Harvard University researcher Dr Tim Laman teamed up for an expedition to explore a remote mountain range on Cape York Peninsula in north-east Australia. The rugged mountain range of Cape Melville is an amazing place—millions of black granite boulders the size of cars and houses piled hundreds of meters high. Surveys have previously been conducted in the boulder-fields around the base of Cape Melville but the plateau of boulder-strewn rainforest on top had remained largely unexplored, fortressed by massive boulder walls. In March this year, with funding from the National Geographic Expedition Council, Hoskin, Laman and a National Geographic film crew flew in by helicopter to explore the uplands. The results were incredible. 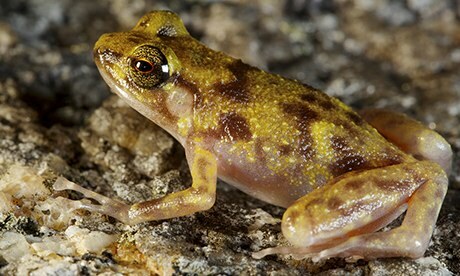 Within several days they had discovered three highly distinct new vertebrate species (a leaf-tailed gecko, a golden-coloured skink, and a boulder-dwelling frog) as well as a host of other interesting species that may also be new to science.